Norwegian animation director Kajsa Næss’ €7.4 million Polar epic Titina supported by the Norwegian Film Institute, plus production of three documentaries and a short. 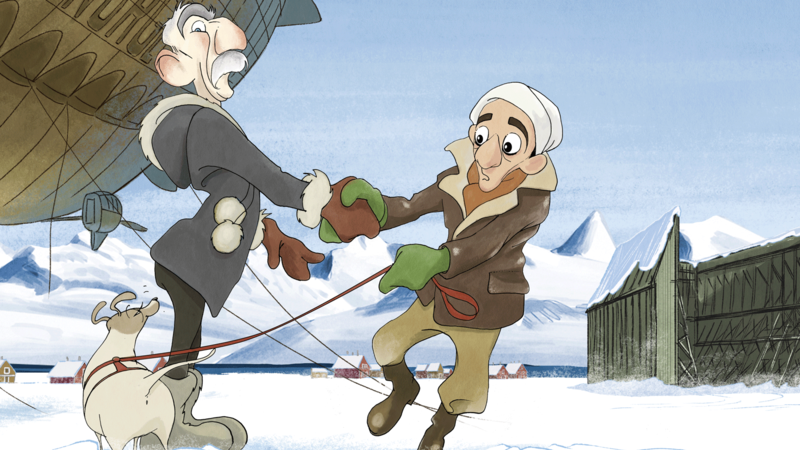 While Amundsen - Norwegian director Espen Sandberg’s biopic of the world’s greatest Polar researcher Roald Amundsen – will be premiered next month (15 February), the Norwegian Film Institute has chipped in €1.5 million (NOK 15 million) for another Amundsen film, Kajsa Næss’ animated feature Titina. In Per Schreiner’s screenplay, the Polar superstar has decided to conquer the last undiscovered spot on the map, but is a bit tired of skiing. After several unsuccessful attempts he gets a starling idea – to fly to the North Pole in an airship. “With a subtle and script by Schreiner, visually and richly realised by animation film nestor Næss, and produced by Oscar-winning Microfilm, ensure that the almost true film about this fantastic Polar drama will make a lasting impression on its audiences both in Norway and internationally, said the institute’s feature film consultant Ståle Stein Berg. Titina is the name of a dog – the first and last fox terrier on the North Pole, accompanying Amundsen and his partner Umberto Nobile on the dangerous journey. Siri Dokken has designed the characters for the €7.4 million (NOK 72 million) production staged by Tonja Skar Reiersen, Lise Fearnley, Axel Helgeland and Kristine Knudsen, for Norway’s Mikrofilm, with Belgium’s Vivi Film. Documentary. Dir/Scr: Kristoffer Carlin. Prods: Sigve Endresen, Thomas Robsahm, Ingunn H Knudsen, for Motlys. A father films his 20-year-old daughter, Emilie, who suffered from Down's Syndrome, from she moves from and during her first year at the Toneheim Folk High School. The school is full of ambitious and talented students who dream of a musical career, some of them with special needs. The film is about sound as medicine, sound as terror, the influence of sound on body and on soul. The chamber pitch from 1939 still controls the tuning of instruments, but during the first months of the Second World War Germany and other powers decided to change it, to better manipulate the masses. Investigating this plot, the film dives into the world of sound through artists, historians, conspiracy theorists and scientists. A culture which is about to disappear: crushed between superpowers, robbed of traditional industries and displaced by other peoples, the Eastern Sami culture in Norway lies with broken back. The language is gone and the remaining cultural expressions are few. Short film. Dir/Scr: Maria Lloyd. Prod: Cecilie Bjørnaraa, for True Fiction. A screenwriter fights with her little black monster while writing a story of co-dependence, in a mixture of fiction with dance and figure elements.